Fantastic location for Summer or Winter Vacation. 4 Bedroom, 2 Bath/Shower room detached chalet built in a traditional style within a residence with heated covered swimming pool and sauna. 2 double beds, 4 single beds, 2 single sofa beds, 2 child singles, 1 child folding bed, 1 cot, 1 high chair. Location - La Joue du Loup in French Hautes-Alpes - 1500m altitude. A 2 hour drive from Grenoble airport - (flights from UK with Ryanair, Monarch and Easyjet) or also Marseille or Lyon Airports. About an 8-10 hour drive from Calais. 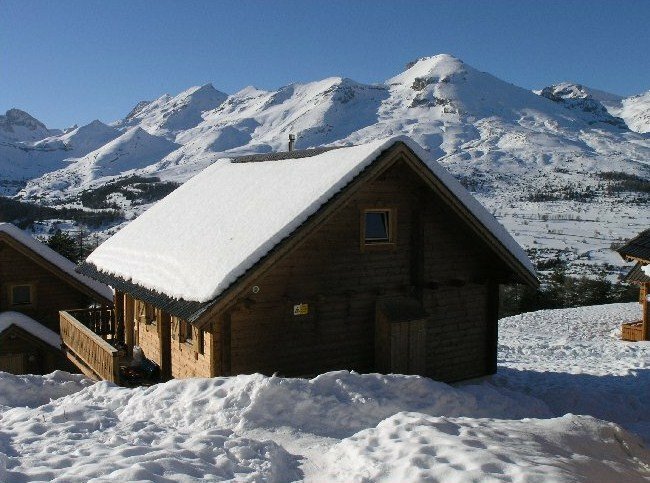 La Joue du Loup is a village of traditionally built chalets and apartments. Good selection of shops and restaurants - 2 supermarkets, ski and clothing shops, bakers, gift shops, gourmet food shops, night-club. Summer - Activities include - Open Air Swimming Pool, Mountain Biking, Walking, Woodland Adventure Park - "Go Ape", Horse Riding, Paintball, Archery, Climbing, Canyoning, Via-Ferrata, Fishing, Paragliding, Mini-Golf, Tennis, In Line Skating. Also white water rafting nearby. An interesting and historic area to explore with plenty going on in the mountains or the valleys. Winter - Walking distance from ski lifts - fast chair/telecabin to Superdévoluy ski range - 100 km of pistes Black 5, Red 15, Blue 23, Green 16. Excellent facilities with 3 mountain restaurants. Snowpark for snowboarders. (AirBags, Ramps, Rails). Children well catered for with Ski Club for youngsters and ski school from 5 years upwards. Sauna in the swimming pool area available for additional charge. Also free wifi available here. Open Air Swimming Pool, Tennis Court, Mini-Golf available across the road (chargeable).